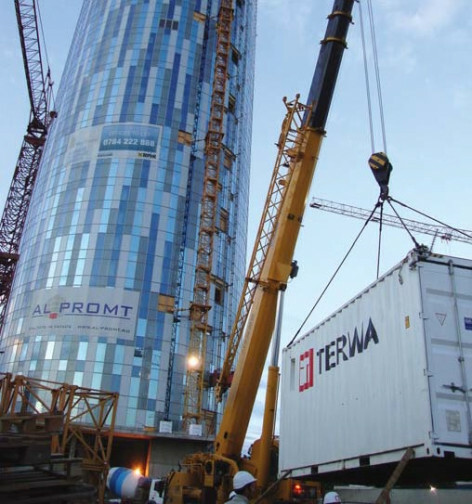 The Terwa Mobile Unit was created by the need to optimize and streamline the work of the builders at the construction sites and to have the products available on site within the fastest way. 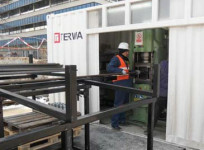 At this time, Terwa owns a various fully equipped Mobile Units that can be used to press couplers on a length of 1-12 meters of rebar steel or, occasionally, even longer lengths. The Terwa Rebar Connection System is a high quality and economic connection of reinforcement and is a simple and efficient method to connect the reinforcement steel which eliminates the disadvantages of the traditional procedure of overlapped joints. The disadvantage of overlapped joints is, a higher consumption of rebar usage, longer mounting time and a connection which is not resistance in the seismic zones. The design of the couplers allows a connection of the reinforcement steel, where the characteristics are equal to the base rebar material. The transfer of loads is made in the rebar, not in the concrete like overlapped joints case. Qualified operator provided by Terwa or training on location. 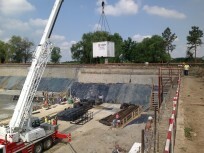 Terwa provides the storage, handling and positioning system for the rebars – so that couplers can be pressed on the rebars until 12 meters lengths or occasionally longer. There is no modification in the characteristics and the structure of the rebar. For maximum efficiency, an area of 20 m x 20 m is required. This includes space for storing raw material.